At the turn of the century Frank Fenton worked for the Northwood Company, a prominent glass production company. The fern pattern in sapphire blue was one of the many patterns of the highly desirable and collectible Northwood glass. Fenton began to manufacture a few pieces of glass in the style of the Northwood Fern pattern in 1952, and discontinued producing the Fern pattern in 1954. Older Northwood pieces are often confused with Fenton's short run. Later Fenton began producing sapphire blue glass pieces exclusively for LG Wright. 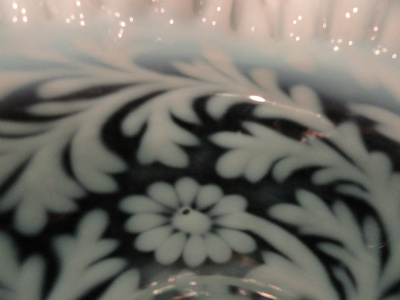 It was at this point that Fenton began to include a daisy in the design. Most collectors refer to this pattern as Daisy and Fern. In 1990, Fenton began production of Daisy and Fern pieces in sapphire blue opalescent glass for the Collector's Extravaganza Series, which this Vintage Fenton Art Glass Daisy And Fern Sapphire Blue Opalescent Ruffled Console Bowl was produced for. 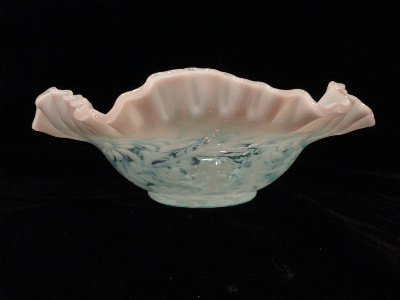 This gorgeous Vintage Fenton Art Glass Daisy And Fern Sapphire Blue Opalescent Ruffled Console Bowl is in perfect condition. It measures approximately 10-1/2" wide and 3-1/2" deep. 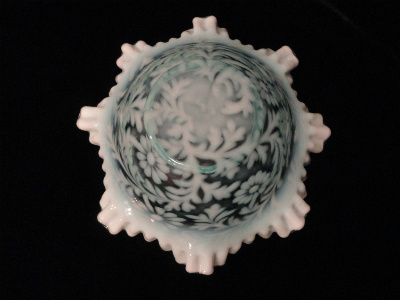 The Daisy and Fern pattern richly adorns the vintage Fenton art glass bowl, which stands out strikingly against the elegant sapphire blue glass. 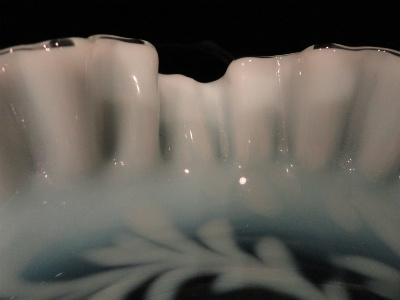 An opalescent ruffled rim runs the circumference of the top edge of the Vintage Fenton Art Glass Daisy And Fern Sapphire Blue Opalescent Ruffled Console Bowl. 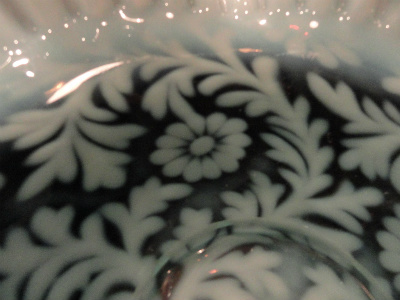 There are a couple of seeds (air bubbles) in this vintage Fenton art glass bowl from the manufacture process. Please see the last photo, where I have captured the image of an air bubble in the center of a daisy. 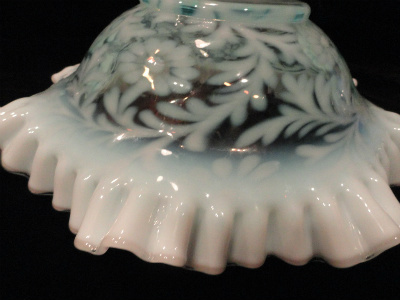 Beautiful and functional, this Vintage Fenton Art Glass Daisy And Fern Sapphire Blue Opalescent Ruffled Console Bowl will perform double duty in your home.